Performing his day job, as he does, on stages across the world with the mighty Maximo Park, who feature in their ranks not only the energetic frontman Paul Smith but also the hyperactive keyboard player Lukas Wooller, it’s probably fair to say that Duncan Lloyd doesn’t get a great deal of the limelight. It’s also fair to say that he never seems particularly worried about this, and gets on with his lead guitarist role with minimum fuss but plenty of impact. 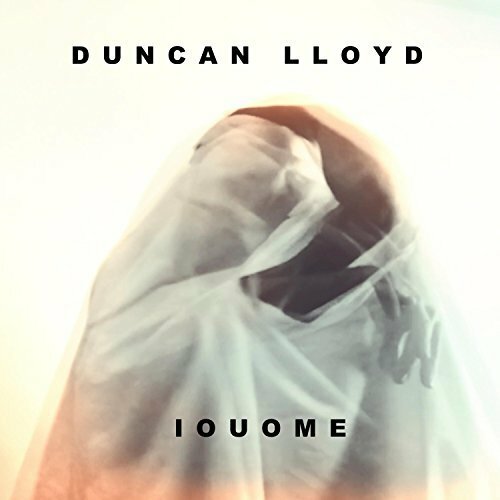 The enigmatically-named I O U O M E is his second solo album, following 2008’s Seeing Double. Lloyd certainly hasn’t rested on his laurels, though, also collaborating with artists such as Decade In Exile and Nano Kino as well as the small matter of knocking out an album every couple of years or so (since 2005) with Maximo, penning much of the material too. So, what does Lloyd sound like as a solo artist (with a little help from bandmate Tom English on drums)? Well, opener ‘The City Weeps’ sounds nothing at all like Maximo Park, more like fellow North-Eastern band Field Music as its fairly cryptic lyrics reference the Liberty Bell and ‘Franklin’ (Roosevelt?) as it chugs along nicely. It is followed, aptly perhaps, by ‘You Seem Confused’ which is the closest thing here to the ‘day job’, it isn’t difficult to imagine Paul Smith scissor-kicking his way through it, though the lovely, minimal keyboard refrains also recall Felt, which is praise indeed if you were in any doubt. There are a couple of songs here about on-the-rocks relationships, the smart power pop blast of ‘Being Frank’ and ‘Heart In Delay’, which features very welcome harmonies from Eternal Summers‘ Nicole Yun. Lloyd comes across as a likeable, self-deprecating student of jangly guitar pop, the understated but multi-tracked vocals on the lolloping ‘Painters’ really effective before a drunken-sounding harmonica break appears that probably won’t have anyone checking the album credits for a Stevie Wonder cameo. ‘Steel Pin Raindrops’ has some quite stark observations about kicking a hard drug habit that are juxtaposed with a sunny, quite wonderful tune. ‘Tomorrow’s Fires’ recalls Australian heroes The Go-Betweens in that poppy period they had before they even had an album out (see their ‘People Say’ single for evidence), while penultimate track ‘Heads Of The Bastille’ is one of the strongest songs on the record, playful keyboards punctuating another really tuneful offering. The album signs off with a track apparently recorded live in Newcastle, the sparse longing of ‘Really’ – it is probably the least immediate track here but after a few listens joins the rest of the record in being a highly listenable, easy-to-like offering. I O U O M E is released by Afternoon In Bed Records on 26th May 2017.